Leighton and Murray postulated that the Martian polar caps, largely carbon dioxide, control the average atmospheric pressure on Mars.40 They wrote this a decade before Viking 1 touched down on Mars. Supposedly CO2 freezes out of the atmosphere at the poles in winter. This drops air pressure. However, it appears from Figure 21 that air pressure actually increased in the Northern hemisphere's winter. The usual response is that the increase in pressure is caused by what was frozen carbon dioxide at the South Pole subliming due to the arrival of summer there. Viking 1's latitude was 22.8º North (still tropics on Mars), but Viking 2 landed at about 48º North, much closer to the North Pole, yet pressures there were still higher in winter although CO2 should freeze out at the North Pole in its winter. With regard to the absolute minimum pressure seen by landers on Mars, we now have 4 Martian years of data for the time around Ls 145 – one for Viking 1, two for Viking 2, and one for MSL. The data is summed up on Table 7. Average Ls = 249.8. REALITY CHECK ON MAY 14, 2016: MSL had its Year 2 minimum pressure at Ls 148 to 149 on its Sols 1334, 1335 and 1336. So the timing of the prediction for minimum pressure was exactly correct. The pressure recorded for these dates was 732 Pa (rather than the 728 to 730 Pa predicted above). Pressure had been running about 2 to 4 Pa lower for Year 2 than Year 1, however the 732 Pa minimum pressure for Year 2 EXACTLY matched the 732 Pa minimum pressure for Year 1. Likewise the maximum pressure for MSL Years 1 and 2 was identical at 925 Pa (but only after several revisions of REMS data) although the Ls of maximum pressure varied from 252 on Year 1 to 257 on Year 2. Not yet factored in: we would expect pressures recorded to drop as MSL climbs Mount Sharp. That there is no difference at all between maximum pressures for MSL Year 1 and Year 2 and again no difference at all between minimum pressures for MSL Years 1 and 2 is highly suspicious which is why we view the prediction as more psychological/political than meteorological. A Martian Year is 668.5891 sols/686.98 Earth days. For Viking 1 and Viking 2 there was only a variation of about two solar degrees (Ls 277.724 to Ls 279.93) between maximum pressures seen. But for MSL from its Year 1 to Year 2 the Ls of the maximum (non-revised) pressure of 925 Pa for Year 1 and 2 shifted from 252 to 257. The statement above was valid until Sol 1,160 when JPL altered an 897 Pa pressure at Ls 66 to 1,177 Pa (more than the pressure sensor on MSL was rated to measure). They reported an even higher pressure (1200 Pa/12 mbar) for Sol 1,161. As we predicted they revised both pressures down to 899 and 898 Pa respectively. The pressure for Ls 66 in MSL Year 1 was 903 Pa. The two high pressures here cannot be explained by having a decimal misplaced as was the case in September 1 to 5, 2012 when 742 to 747 hPa was altered to 742 to 747 Pa. Clearly the sol 1,160 and 1,161 high pressures are related to serious “personnel issues” within the NASA/JPL/REMS Team organization. The problem here is captured by print-screens shown as Figure 21A. .Figure 21A � 1,177 and 1,200 maximum pressures published exceeded the 1,150 Pa limit of the Vaisala pressure sensor on MSL. Later the REMS Team put out a pressure of 1,154 Pa for Sol 1301, but revised it to 752 Pa after we published a prediction at http://marscorrect.com/photo2_29.html that they would do so. The high pressures are probably errors but they certainly point to personnel problems within the NASA/JPL/REMS Team organization. Overlooking the pressures shown on Figure 21B, the total variation for Ls of maximum pressure is from Ls 257 (MSL Year 2) to Ls 279.93 (Viking 2). This is a difference of 22.93 solar degrees. See Table 8. Given the small variation in daily pressures from MSL Year 1 and 2 (about 2.5 Pa per sol with a standard deviation of about 2.115 Pa for the first 118 sols of MSL Year 2), the large variation for the sol of maximum pressure is somewhat surprising and may be another hint that the pressure measurements are flawed. There was no variation in maximum pressure between MSL Year 1 and 2. Both were given as 925 Pa.
As is indicated on Table 7, the data available to the public from the Viking Computer Facility (and Professor Tillman) lacks information about Ls 90 for both Vikings. However for Viking 1 there was a 1 mbar decrease in pressure from Ls 97 to Ls 150.156 (7.51 mbar down to 6.51 mbar). For Viking 2 Year 1 pressure decreased 0.43 mbar from Ls 118 to Ls 145 and for Viking 2 Year pressure decreased 0.769 mbar from Ls 100 to Ls 148.48 and 155.393. These Figures are based on essentially hourly temperature readings (25 per sol). For MSL we only have questionably revised daily average pressures, but from Ls 90 to Ls 147 there was a decrease of 1.25 mbar in Year 1 and 1.17 mbar in Year 2. Table 8 - Landers and Expected Pressures Based on Landing Altitude. *Originally JPL published a pressure of 7.05 mbar for Sol 1 at Ls 150, and 7.18 mbar for Sol 9 at Ls 155. See Table 7 notes. Using a scale height of 10.8, and an average pressure of 6.1 mbar at areoid, the average annual pressure at Viking 1 should be about 8.535 mbar, while for Viking 2 we would expect about 9.257 mbar. The difference is 0.722 mbar (see Table 1 earlier in this report). Viking 2 is estimated to have landed at 48.269° North (there are slight differences published for this figure), whereas (see Table 9), it got much colder (down to -117.34° C, which is 155.81K in year 2) on the winter solstice (Ls 270°) than what was experienced at Viking 1 (down to -95.14° C which is 178.01K in year 1), which landed in the tropics at 22.697° North. These temperatures are still too warm for snow to fall as frozen carbon dioxide. The temperatures required for that is supposedly -128° C (145.15K) or colder, which is associated with a latitude of 70º N or higher.42 How long would there be no daylight at all at 70º N or S? Annex L shows how day length varies with Ls and latitude on Mars. For the southern hemisphere at 70º S there is no sunrise from Ls 54.2 until Ls 125.9. For MSL this was between November 24, 2013 and May 5, 2014 (157 Martian sols). Further south the time in total darkness is lengthened. Due to the eccentricity of the Martian orbit, the spans of darkness are not the same at north and south poles. Martian months, each 30º of Ls position apart, vary from 46 sols at perihelion to 66 sols to aphelion. The South Pole is in cold darkness for 371 sols while the North Pole would is dark for 297 sols, a difference of 74 sols. After May 5, 2014 (Ls 125.9) at 70º S sunlight shines at that latitude and daylight lengthens between there and the Antarctic circle at 64.81º S, and yet MSL data backs Viking 1 and 2 data showing a decrease in worldwide pressure on Mars until at least Ls 145 – all supposedly due to carbon dioxide freezing at the South Pole. Ls 145 was reached by MSL on June 13, 2014 (see Annex L). At the start of the MSL mission the REMS changes made several changes to its data; but now shows a pressure of 732 Pa on Sol 13. Ashima Research did not replicate that data on its site. For Sol 15 as of July 17, 2014, REMS shows a pressure of 740 Pa while Ashima lists the pressure for Sol 15 at 730 Pa. The Sol 15 reports agree about date (August 21, 2012), however REMS shows the Ls at 158 and Ashima shows it as a 159. On on-line calendar at http://www-mars.lmd.jussieu.fr/mars/time/martian_time.html shows that the sol started at Ls 158.3 While both REMS and Ashima list the minimum air temperature as -78° C, they disagree about maximum air temperature with REMS listing it as -15° C and Ashima posting -1° C.
Figure 22 below: There are many differences in the reports posted by the JPL REMS Team and Ashima Research before they ceased publication. Ashima claimed it took its data directly from MSL REMS. For Sol 668 REMS lists the pressure at 734 Pa with the Ls 150. 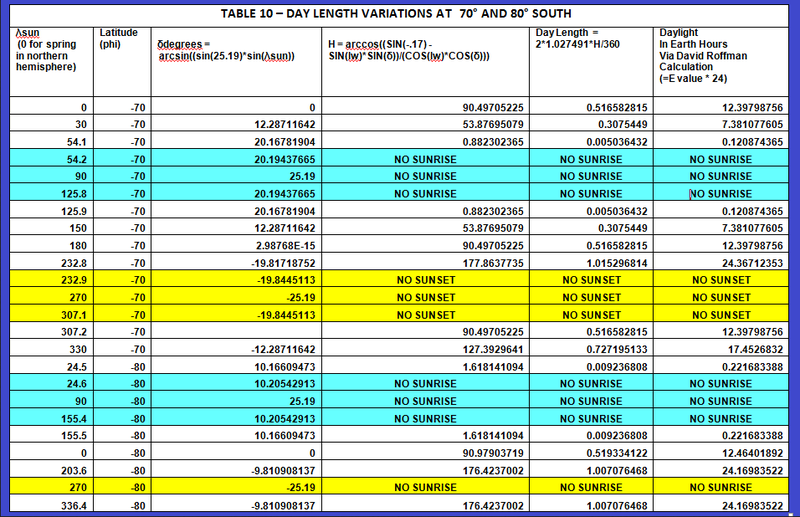 Ashima showed 7.30 hPa (730 Pa) but gave the Earth date as June 21, 2014 rather than June 23, 2014. At the start of the MSL mission the REMS made several changes to its data, but now shows a pressure of 732 Pa on Sol 13. (August 19, 2016) Ashima Research did not replicate that data on its site. For Sol 15 as of May 25, 216, REMS shows a pressure of 740 Pa while Ashima listed the pressure for Sol 15 at 730 Pa. The Sol 15 reports agree about date (August 21, 2012), however REMS shows the Ls at 158 and Ashima showed it as a 159. An on-line calendar at http://www-mars.lmd.jussieu.fr/mars/time/martian_time.html shows that the sol started at Ls 158.3 While both REMS and Ashima listed the minimum air temperature as -78� C, they disagreed about maximum air temperature with REMS listing it as -15� C and Ashima posting -1� C.
Maximum pressure stated (after MSL revisions removing 12, 11.77, 11.49, 9.54, 9.4, and 9.37 mbar). On May 5, 2014 pressure at MSL was listed as 7.65 mbar. At Ls 145 pressure was down to 7.35 mbar. In fact, it actually went down after that to 7.30 mbar on Sol 668 at Ls 150. However weather data at the beginning of the MSL mission was later revised a lot. While later altered to N/A, originally the REMS Team published a pressure of 7.05 mbar for Sol 1 at Ls 150, and 7.18 mbar for Sol 9 at Ls 155. For Viking 2 the hourly pressures for the sol around Ls 125.9 pressures were between 7.56 and 7.64 mbar, however as is addressed in great detail in Annex C to (see http://marscorrect.com/ANNEX%20C%209%20September%202013.pdf), pressures do not appear to be reliable because they were generally stuck at 7.64. Annex C (pages C-18 to C-19) show that in Viking 2 pressures were also stuck at Ls 125, but the pressure it was stuck at was 7.56 mbar, however due to data digitization (discussed in Section 2.6.1 and Table 4B of this report), pressures between 7.56 and 7.64 were generally) not published (and if they were they based on interpolation rather than actual transmitted data). For Viking 2, (at about 48º North) Ls 145 on Year 1 pressures were down to between 7.29 and 7.47 mbar. The 7.29 mbar pressure was reported for Ls 145.745 and it was the lowest pressure observed for Viking 2 in Year 1. For Viking 2 at Ls 145 pressures were stuck at 7.38 mbar (see page C-40 in Annex C to this report) for part of the Ls, but were often stuck at 7.47 mbar, the same pressure given for Viking 2 Year 1 at this Ls.44 For Viking 2 Year 2 the minimum pressure of 7.27 mbar was observed at Ls 148.48 and again as late as Ls 155.393, over 65 degrees past winter solstice. Read and Lewis note that, “the thermal inertia of the surface… takes some time to change its temperature and tends to lag behind the seasonal movement of the subsolar point,” but this much of a lag, given no ocean (at least on the surface), is enough to suggest that carbon dioxide at the poles is not at the root cause of pressure fluctuations, assuming that pressure readings are not distorted by inadequately designed pressure transducers. As indicated earlier, the driving idea behind Martian air pressure cycles seems to be the work of Leighton and Murray (1966), published ten years before any lander would be on Mars transmitting in situ pressures back to Earth. They postulated that the Martian polar caps, largely carbon dioxide, control the average atmospheric pressure on Mars. If they were right we might understand the almost even double hump curve (see Figure 23) of Martian pressure shown below (for each Martian year) based on how pressures at MSL were reported, but they were wrong about a number of things including their belief that that the permanent deposit of CO2 would be found in the north.40 One pole that is largely carbon dioxide ice and the opposite pole that is water ice should not produce such symmetrical pressure spikes twice each year. Having seen JPL alter data (often after prompting from us), we believe that the pressure curves seen on Figure 23 are due to unwarranted data manipulation and loyalty to Leighton and Murray's 1966 discredited ideas. Figure 23 � Pressure curve for MSL's first 866 sols. Given the fact that about a meter CO2 is condensing out of the atmosphere over the Martian North Pole in its winter, we might expect the pressure to not be as high there as it is in the tropics, where at least on Earth, the atmosphere is thicker anyway. But the average pressure between Ls 270° and 271° was 9.771 mbar for Viking 2's Year 1 and 9.937 mbar for the same period for its Year 2. During this same period for Viking 1 the average pressure was given as only 8.793 mbar. So for Year 1, the average pressure was 0.978 mbar higher than expected at Viking 2; and for Year 2 it was 1.114 mbar higher than projected. Whatever carbon dioxide was supposed to be sublimating at the South Pole where it was summer solstice did not seem to affect the much closer Viking 1 as much as it allegedly did the much further North Viking 2. JPL data manipulation was also seen for off the curve MSL Sol 370. 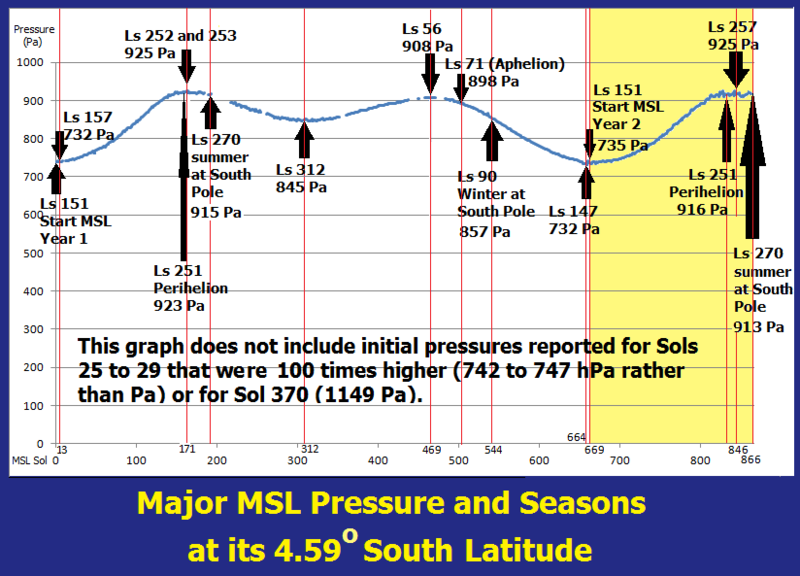 Although the pressures for Sol 369 and 371 were both 865 Pa, for Sol 370 what was reported was an all- time high mean pressure: 1149 Pa, essentially the upper limit in the pressure that the transducer could measure. It occurred at Ls 9 on September 21, 2013 (see Sections 2.5 and Figures 13 to 14D). Any mean reading this high indicates higher pressure that could not be measured. So what did JPL do? As stated earlier they simply changed 1149 Pa to 865 Pa with the hope or belief that nobody would notice, so it’s hard to believe that the 1,179 and 1,200 Pa pressures for sols 1,160 and 1,161 will stand.